We offer a complete line of in-stock CAA Premium car batteries, car battery testing, and car battery installations performed by licensed mechanics. Call us for a boost or a new battery; we will test your car's battery to determine if it's still maintaining an adequate charge and can replace on the spot with a CAA Premium battery. 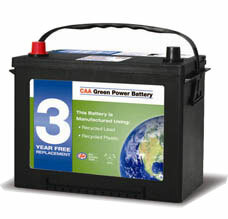 CAA Premium car batteries are manufactured by a leading manufacturer carry an excellent warranty. If your car battery fails within the first 3 years, you’ll get a free replacement. After 3 years, you're protected by our discounted guarantee. When your car battery fails, a boost will often help you get to your next destination; but it does not fix the real problem. When this happens to you, a CAA Mobile Car Battery Service will deliver and install a heavy-duty or premium battery that is right for your vehicle. If the battery does not need to be replaced we will not replace it.